There is a $30 entrance fee for this park, good for 7 consecutive days. Alternatives are Annual and Golden Age passes. The Nisqually Glacier flows from the summit of Mount Rainier. Although its terminus is no longer visible from this location, you will be able to see signs of its former presence in the valley below. The Nisqually, like all of Mount Rainier’s twenty-five named glaciers, is in flux, melting back or advancing as rapidly as three feet per day. The Longmires first noticed that the Nisqually was receding about 1890. Accustomed to obtaining ice from the glacier for use in preserving perishable foods, members of the Longmire household noticed that they were required to walk farther each year to reach the snout of the glacier. The upper part of a glacier that receives most of the snowfall is called the accumulation zone. In general, the accumulation zone accounts for 60-70% of the glacier's surface area. The depth of ice in the accumulation zone exerts a downward force sufficient to cause deep erosion of the rock in this area. After the glacier is gone, this often leaves a bowl or amphitheater-shaped isostatic depression called a cirque. On the opposite end of the glacier, at its foot or terminal, is the deposition or ablation zone, where more ice is lost through melting than gained from snowfall and sediment is deposited. The place where the glacier thins to nothing is called the ice front or terminus. The "health" of a glacier is defined by the area of the accumulation zone compared to the ablation zone. Healthy glaciers have large accumulation zones. In the aftermath of the Little Ice Age, around 1850, the glaciers of the Earth have retreated substantially. Glacier retreat has increased since the 1980s, the coldest decade since 1900. Glaciers move, or "flow", downhill. While the bulk of a glacier flows in the direction of lower elevation, every point of the glacier can move at a different rate, and in a different direction. The general motion is due to the force of gravity, and the rate of flow at each point on the glacier is affected by many factors. As the climate changes, glaciers respond both long and short term. It may take up to seven years for a glacier to advance or retreat in response to a locally severe or dry winter. In addition to these normal variations in local weather patterns, there is the effect of global changes which have more of a long term effect on the glaciers. The top 50 meters of a glacier are more rigid. In this section, known as the fracture zone, the ice mostly moves as a single unit. Ice in the fracture zone moves over the top of the lower section. When the glacier moves through irregular terrain, cracks form in the fracture zone. These cracks can be up to 50 meters deep, at which point they meet the plastic like flow underneath that seals them. The speed of glacial displacement is partly determined by friction. Friction makes the ice at the bottom of the glacier move more slowly than the upper portion. In alpine glaciers, friction is also generated at the valley's side walls, which slows the edges relative to the center. This was confirmed by experiments in the 19th century, in which stakes were planted in a line across an alpine glacier, and as time passed, those in the center moved farther. Mean speeds vary; some have speeds so slow that trees can establish themselves among the deposited scourings. In other cases they can move as fast as meters per day, as in the case of Antarctica's Byrd Glacier, which moves 750-800 meters per year. Many glaciers have periods of very rapid advancement called surges. These glaciers exhibit normal movement until suddenly they accelerate, then return to their previous state. During these surges, the glacier may reach velocities far greater than normal speed. These surges may be caused by failure of the underlying bedrock, the ponding of meltwater at the base of the glacier or the simple accumulation of mass beyond a critical "tipping point." 1. Go to the given and waypoint coordinates and observe the mountain from these vantage points to get answers to the questions. Refer to the written materials on this cache page to help as needed. Note: please park only in designated parking spots and do not leave the trails/sidewalks during your explorations. Note: if the mountain is wrapped in a cloud, please observe as much as possible and then do a bit of research if needed. 2. Please try to send your answers to the questions to me and log your find at the same time so that I don't lose track of who sent answers. 3. If possible, send your answers the message center, either by going to the top of the cache page and selecting "Message this owner" or by going to my profile and selecting "Send Message" I will then be able to respond directly and easily. If you select "Send Email," I will still respond via the message center. b) The Nisqually Glacier once reached the bridge. Currently it has retreated approximately 1.5 miles from the bridge. Do you think this retreat has been constant during the last 100 years? c) Looking into the valley, give 2 or 3 evidences you see that the glacier was once there? * c) foggy day alternate: Read the cache text and possibly do a bit of research to determine the typical appearance of glacial valleys. 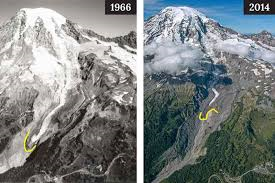 d) Do you think the glacial retreat trend will continue? Give reasons for your answer. Please say more than "global warming." e) What might be the implications of glacial retreat for humans? 5. Photos are optional, and always enjoyed as long as they don't give away any answers. This earthcache was written to be used as part of the Visit Rainier Centennial GeoTour - 100 geocaches to celebrate 100 years of the National Park Service. While the GeoTour has ended, can still enjoy visiting many of these special places. Check this bookmark to see the original 100 GeoTour caches. A National Parks pass or entry fee is required to enter Mount Rainier National Park. Gurer ner ab vasbezngvba obneqf gb hfr sbe guvf rnegupnpur.